Why Isn't Google Chrome A Part Of Android? Over the past couple of years covering Google, there’s one seemingly simple question that comes up again and again, that Google just can’t seem to answer. Why isn’t Chrome a part of Android? Read the wrong way, that could seem like a deep question. But it almost never means “why isn’t Chrome OS simply merged with Android?” or the like. Most of the time, it’s simply a question wondering why Google’s very popular web browser is not a part of their very popular mobile operating system? After all, that OS has a browser (the aptly-named “Browser”), but it’s not Chrome. Why not? Unsurprisingly, the question came up once again at Google I/O last week. During a panel with a bunch of engineers on the Chrome team, it was one of the first questions asked. The response? “It’s not something we’re talking about right now.” Ouch. Another team member, probably realizing those answers sounded both cryptic and harsh, chimed in. “The important thing at the end of the day is to make browsers better. While it’s not strictly Chrome, we share a lot of code with the Android team. We’ll share more over time.” Okay, that’s better. Still, a bit odd. Based on my understanding, after having a number of discussions on this topic over the years, it would seem that boils down to a few things. First, the Android team is a completely separate team from the Chrome team. Second, it’s a branding issue that Google isn’t quite sure how to resolve. Third, the Android browser, while similar to Chrome, really isn’t Chrome. The first and second issues are interesting because more and more, they’re related. As they showcased at I/O this year, Google now is fully backing two horses in the OS race: Android and Chrome OS. Each are made by two entirely different teams that don’t often mix with one another. As Google executives kept saying over and over again when asked last week, the two OSes have different goals — and are going about things in completely different ways. While Chrome may have started out as a web browser, it’s now much more from an ideology perspective inside of Google. No one will admit this, but if they’re to ultimately succeed, they sort of have to believe that Android won’t. That makes it hard to work together. When Android first launched in October of 2008, it seemed like either a small oversight or precautionary measure that the browser bundled with it wasn’t branded as Chrome. After all, Google’s browser had just launched in beta (on Windows) the month before. Assuming people liked it, you would have assumed that Google would transfer the branding over to use in Android, right? Well people did like Chrome. A lot. And yet, Google never moved it over. This despite the fact that Apple did just that on the iPhone with its much less successful Safari browser. Meanwhile, Opera and Mozilla’s Firefox were committed to mobile versions of their popular browsers as well. But Google stuck with “Browser” for Android. The same issues are true with Apple’s regular Safari browser and their mobile one. But that browser generally seems to be less feature-focused, so the branding might not be as big of an issue. Plus, even if the two sides don’t work closely together inside of Apple (though it seems like they might), does anyone really believe there’s any way in hell Steve Jobs would let the browser in iOS be called anything but Safari? Back to Google, on the flip side of things, the Android team have their own wants and needs for the browser bundled with their software. And imagine if a problem on the Chrome team was stalling a new Android build? Or vice versa? But with the launch of Honeycomb, Android’s Browser is now starting to look a lot more like Chrome as well, thanks to the tabbed browsing experience it offers. This will only lead to more questions. And it’s only a matter of time before users start demanding that elements are fully synced between the two (Chrome and Android’s Browser). At that point, Google may have to consider this question yet again. 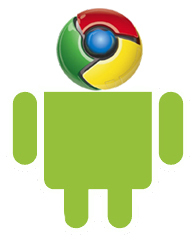 Is it time to bring Chrome to Android?